When Jay from Devon was growing up, he had no idea of what it was like to live in a stable family home, to have friends to play with or to spend more than a year in the same school. From the age of ten, Jay was a child in care, dependent on the system and the foster carers he was placed with. Frustrated at being moved from pillar to post, Jay rebelled at school and got involved in crime, “I was a thug, I got excluded from school and I rebelled at every opportunity because I knew I’d soon be moving on. I didn’t know how to make friends because I’d never had the time to” Jay says. One evening Jay got the wake-up call he needed, when eight police officers turned up at the door of his foster carer’s house to take him down to the station. Jay sat in a cell and thought he’d be quickly returned to the system once his carer heard what had happened; but that wasn’t the case. On leaving care at 17, Jay remained in close contact with his foster support workers. Keen to do something to help other children and young people in care, Jay started volunteering with activities for children in care that he had benefitted from when he was younger. When the group started to run Bronze DofE programmes for the fostering service, Jay wanted to get involved too. He spoke to his support worker who recommended he go for Gold – the top level and most highly regarded DofE Award. But Jay took the plunge and never looked back, after raising over £1,500 to travel to South Africa for both his Residential and Expedition sections where he spent three weeks with a group of people he’d never met before, camped in caves in a rainforest home to leopards and helping members of a Zulu tribe with washing and gardening, Jay returned to Devon well on his way to achieving his Gold DofE and as a completely new person. As part of his Gold DofE, Jay was also able to gain skills in archery and learn how to climb. And for the Voluntary section he continued to volunteer with young people in care, helping with different activities, including assisting with their Bronze Award programmes, gaining a qualification in archery and fencing in the process. Jay says: “It’s amazing what the DofE can do, you can meet new people and stay in contact, make friends for life. It has massively changed my life. I had never really achieved anything and the DofE gave me the chance to achieve something and feel really proud of myself. I look back now and think if I hadn’t have done my DofE, where would I be now? I can’t imagine it. It’s been a real journey and if it wasn’t for my support worker, Richard, I’d never have got to where I am now. 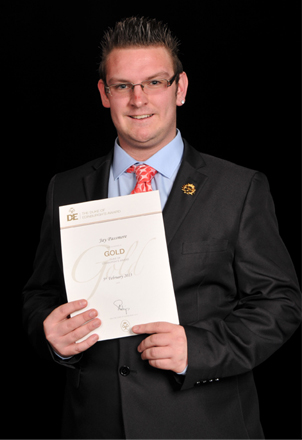 Jay received his Gold DofE at St James’s Palace on 5th February 2013. He continues to volunteer his time at a local youth group every week.